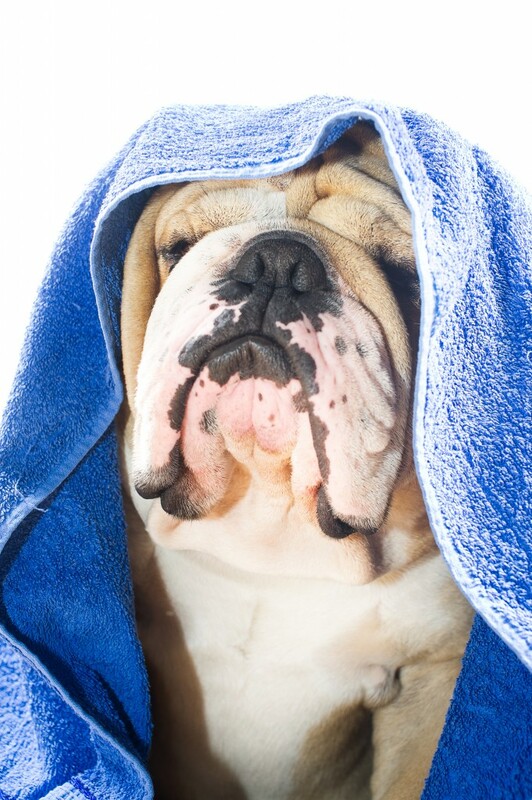 It’s not rocket science but giving your bulldog a bath takes time and patience. There are many wrinkles and rolls that need attention. With little attention paid, those wrinkles can get smelly sometimes, especially in the summer. You only need a few things to getting your bulldog to smell so good. 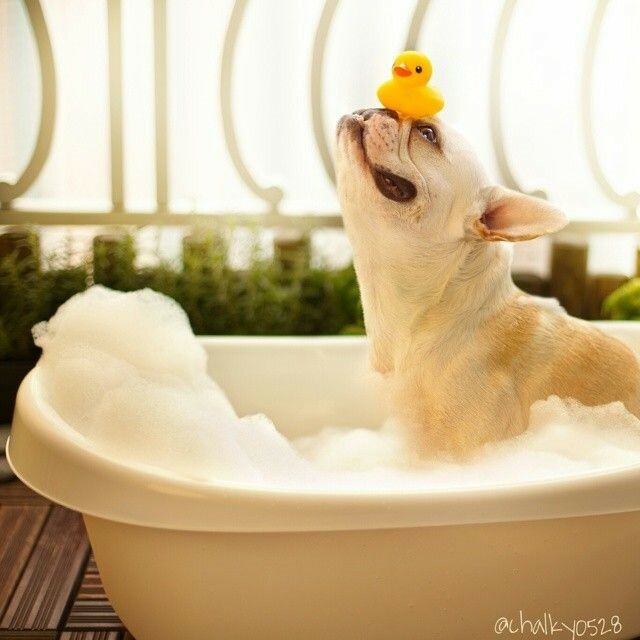 While humans need to bathe every day or every other day, bulldogs only need a bath every month or every two months. That beautiful coat has tons of protective oils that are a natural parasite repellent. These oils keep your bully’s sensitive skin from getting too dry. Choose a time every day to brush your dog’s coat. Brushing his coat every day will help get rid of dead hair and any dirt that he may have picked up during the day. It is a good idea to brush your dog before every bath. It will keep the amount of hair in the tub down and lessen the time it will take to clean up when you are done. The best brush to use is a soft bristle brush or one that has rounded bristles to shield his sensitive skin. Go against the grain first to get all the dead hair and anything gross out and then go with the grain. 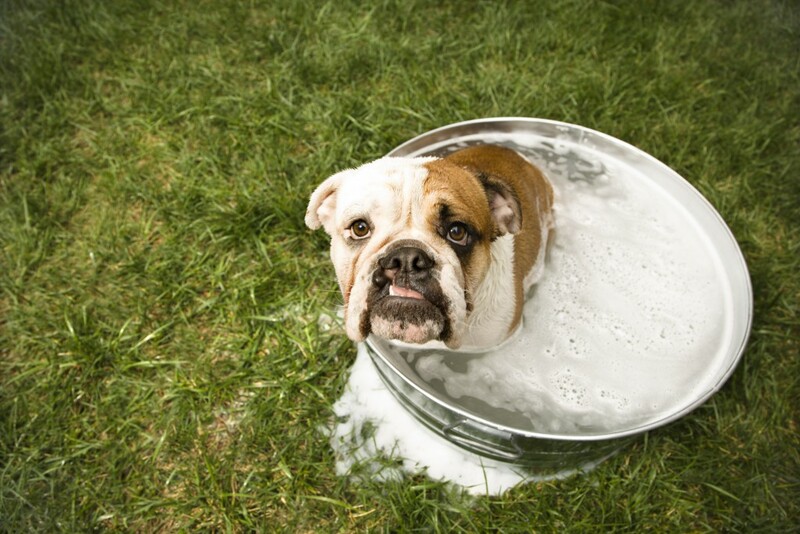 You will need to fill up the tub or pool with warm water so your bully doesn’t get too cold. You only need a few inches of water so don’t worry about your dog taking a swim. Starting with his neck, pour water on your dog until he is wet. Do not get water in his ears or on his face; that will come later. Next, you need to get him soapy. Using small amounts of shampoo, massage it gently into your dog’s coat. By using a shampoo with a parasite repellent, you are helping to rebuild the oils back in his fur. Start at the neck and wash him back to his tail. Use small circular movements and your fingertips to gradually lather him up. Don’t forget under his chest, stomach, legs and under his tail. Once he is covered in a good lather, rinse him off, again starting at the neck and working your way back to his tail. Use your fingers to lift the fur to make sure you rinse all the shampoo out. Now you can let your bully out of the water and start to dry him off with the towel. Softly rub the towel up and down to make sure you get as much water as you can. Watch out for the shower he will definitely give to you! While you both wait for his coat to air dry, you can start to clean his ears and face like you do every day. Use the cotton swabs dipped in warm water to clean each wrinkle. Keep doing so until the swabs are clean then, use a dry swab to get any moisture out of the folds. If this step is not done, you could be creating a place for bacteria to grow. You don’t have to worry about neglecting your bully if you don’t give him regular baths. He actually won’t mind much at all. By spacing out the bath time ritual, you are helping protect his skin by not stripping any oils that are beneficial to his sensitive skin. Follow these steps and both of you will love bath time, every time!